Studio Blog: What Is Skylanders Giants? Regarded by many as the new Pokémon, Skylanders Giants combines both physical and digital elements to create an engaging, addictive and hugely fun video game experience. Users buy figurines of their favourite Skylanders characters and attach them to a USB ‘portal’ which is linked to their games console. The character is then displayed digitally on screen and can be used to play the game and fight battles. This is where the collectible element comes into Skylanders; the more figurines you have, the more variation and greater choice of characters you’ll have when playing the game. Trading cards are also available, which is another factor responsible for Skylanders being compared to Pokémon. Who is Skylanders Giants aimed at? Like other collectible game franchises, Skylanders is aimed primarily at younger children due to its colourful, monster like characters and fantasy style plot. However, Skylanders Giants, which is the latest games in the series, has a slightly more sophisticated system of game play, which has seen it gain popularity with older gamers. Where can you buy Skylanders Giants products and what’s available? An extensive range of Skylanders Giants products is available at 24studio.co.uk. Here, you’ll find everything from figurines, to bedding, to the video game itself, all of which make brilliant gifts for birthdays, Christmas or simply to keep young children quiet and occupied during half-term or summer holidays. You can even spread the cost of your purchase with a 24studio account. A games console starter pack is an essential piece of kit for any new Skylanders Giants fan. Inside, you’ll find the game (obviously), the portal, 1 Giants figure, 2 regular Skylanders figures, a collection of trading cards and some stickers. At just £49.99, the starter pack is a bargain considering console games on their own can cost the same price. There are 48 new characters to collect for Skylanders Giants, all with their own special powers and skills to help enhance and prolong your Skylanders experience. Remember, characters from previous games can be used with Skylanders Giants, so, in total, there are around 125 characters to collect! Each pack comes with a trading card and sticker sheet containing a secret code. This colourful duvet set is guaranteed to help any Skylanders fan drift off into a peaceful sleep. 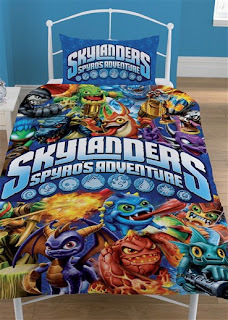 Many of the most popular Skylanders characters are featured on the duvet, including Spyro the dragon. This item has been selling particularly well recently, so get yours now to avoid disappointment. With our free personalisation service, you can add a name of your choice to a pair of Skylanders Giants pyjamas for no extra cost. By doing so, you’ll create a unique birthday or Christmas present, which your child will be proud of and want to show off to their friends. The pyjamas are 100% cotton and available in up to 9 different sizes. These Skylanders Personalised Pyjamas are an absolute bargain at just £4.99! 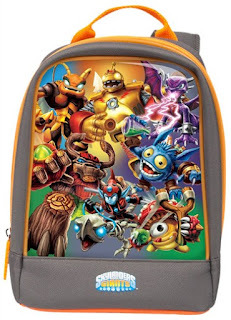 Give your child one of these cool Skylanders backpacks and they’ll be the envy of every other child at school! Skylanders backpacks are available in both blue and orange and provide a good amount of space to store books, lunch and sports clothing. There’s even space to store Skylanders figures and other game accessories so your child can show off and compare their collection with their friends at school. A handy carry handle is attached to the top of the backpack for easy carrying and travelling. Looking for more great toys and gifts? Take a look at everything else 24studio.co.uk has to offer.